What a stunning day of weather we had for the wedding of Louise and Lee who were married at The Lawn, Rochford on Saturday 11th July. I loved this wedding cake. It was so simple, yet so elegant. 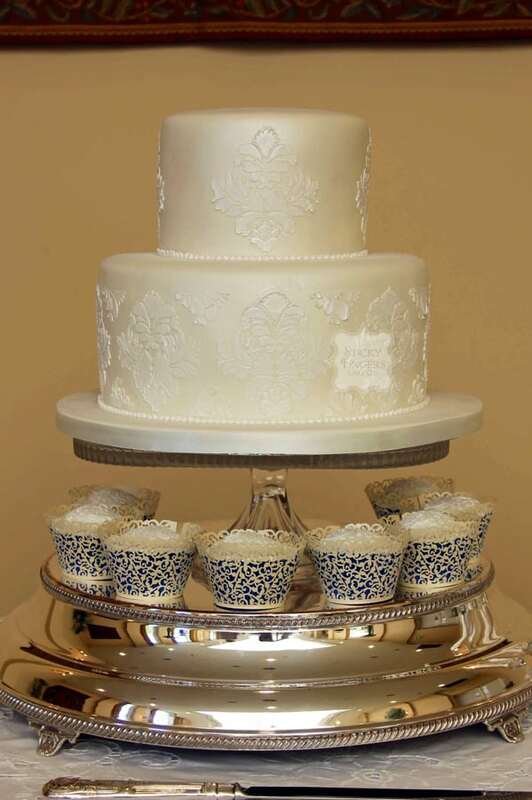 The happy couple had fixed ideas on how they wanted the cake to look, the brief being a 2 tier, ivory wedding cake with a simple stencilled damask pattern with a highly shimmered finish and just a piped edge instead of a ribbon trim. The 2 tiers consisted of a Madagascan Vanilla Bean bottom tier and a Red Velvet top tier. They also asked me to make 10 Dark Chocolate cupcakes, decorated in a similar style to the cake. There were 2 guests with a nut allergy so I made 2 of the cupcakes with just a swirl of butter cream and boxed them up separately so they didn’t miss out on all the cake on offer! As favours for the guests, I made “Bride and Groom” cake pops, Dark Chocolate for the “Brides” and Vanilla for the “Grooms”, gift wrapped with a royal blue ribbon (the happy couple’s colour scheme). For the guests with a nut allergy I made simple cookie favours. Congratulations Louise and Lee! I hope you have a long and happy life together..